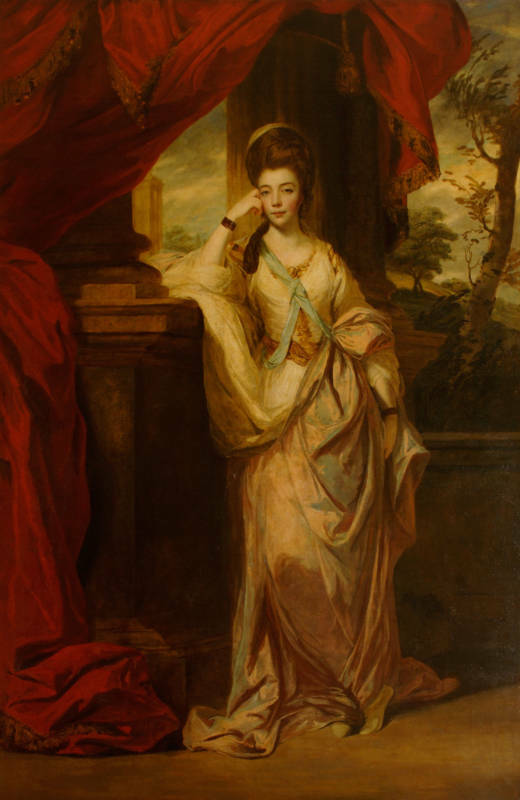 This painting helped to fashion the public image of Lady Anne Luttrell, a young widow who had eloped with George III’s youngest brother, Frederick Duke of Cumberland (1721-1765), in 1771. The marriage caused such consternation that in 1772 the king passed an Act of Parliament requiring members of the royal family to obtain the sovereign’s permission to marry. Reynolds’s portrait of the duchess was exhibited at the Royal Academy the following year and could hardly represent the controversial sitter in a more regal manner. While the luxury and languor of the painting is reminiscent of the work of Peter Lely (1618-1680), the fictive architectural setting with the red curtain, classical stonework and glimpse of landscape beyond, recall the grand manner portraits of Peter Paul Rubens (1577-1640) and Anthony Van Dyck (1599-1641). The pillar behind the sitter amplifies her height, which is further emphasised by her high-piled hair and tumbling drapery. Reynolds’s careful modelling of the eyes – a white highlight in the left eye, the right eye in shadow; the lower lids, upper lids and area between lids and brows carefully differentiated – makes clear that the sitter is looking down at the spectator. However, any suggestion of hauteur is counterbalanced by the seductive directness of her gaze. 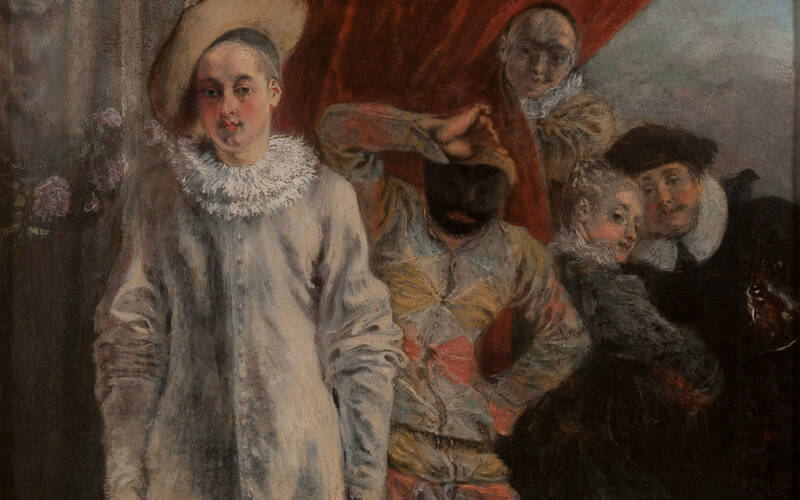 Immediately after leaving this room, turn left, and on your left is a painting by Antoine Watteau (1684-1721) Pierrot, Harlequin and Scapin, which Reynolds owned when it was known as ‘A Masquerade’ along with a painting known as ‘The Music Lesson’, now in the Wallace Collection.